A 5-day immersion in the very best Languedoc has to offer. From your base in a comfortable and charming home, we will travel through some of the most picturesque spots from the Mediterranean coast to the breathtaking Haut Cantons, and discover the rich cultural history of the area. We will meet artisan producers of such delicacies as Pelardon, the famed tangy and creamy goat cheese, sample the rustic traditional charcuterie, and enjoy comparative tastings of regional olive oils made from the indigenous Lucques and Olivieres varieties. We’ll dine at many venues from casual bistros favored by the locals, to more formal restaurants and private homes. 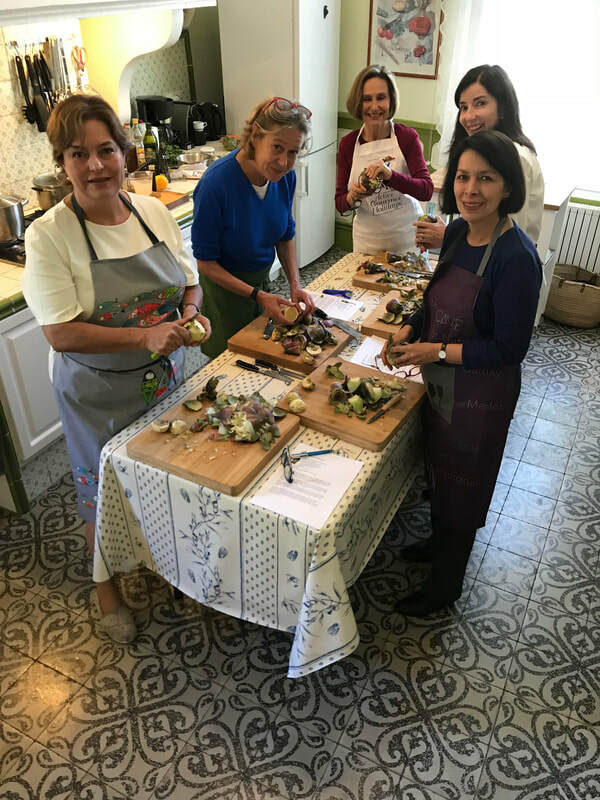 Along the way, you will become an astute wine connoisseur and get first-hand knowledge of the region’s cuisine through hands-on cooking classes. You will also have many opportunities for sightseeing and shopping on your own. The following is an overview of the itinerary and is subject to change. Arrival at the airport or train station. Transfer to the house. Welcome aperitif followed by dinner. You’ll meet a winemaker and his family. After a guided tour of his vineyard, you’ll enjoy a comprehensive wine tasting followed by a picnic lunch. You will have time to relax in the afternoon before the evening cooking class and dinner. Following breakfast, depart for a visit of Beziers – a town largely undiscovered by tourists – for a quick tour of the beautiful historical center. You’ll also stop at Les Halles, a small indoor market, to pick out the ingredients for the afternoon cooking class. Stop for an early lunch at a local wine bar in Beziers. In the afternoon, you'll head to the beautiful Canal du Midi for a cruise. The canal will take you by some magnificent sites of the Languedoc, such as the canal bridge outside of Beziers and the series of nine locks, which was first built in 1679. You will have time to relax in the afternoon before the evening cooking class and dinner. This morning, head to a wine estate for a special truffle day. First meet a truffle expert at a recently-renovated old wine estate. A mini-demonstration will teach you how truffles grow, how to cultivate them, and what to look for when purchasing this delicacy. Next, follow a trained truffle hunting dog into the nearby woods. Savor the opportunity to sample different types of truffles. The cooking class of the day will take place at the estate and it will be all about truffles. After some time to relax, dinner will be at a local bistro. The day will begin with a leisurely stroll through Narbonne and shop at the bustling halles, the indoor market in the center of town. You will enjoy lunch at a restaurant featuring local seasonal produce. On the way back, you will stop at one of La Clape wineries, a little-known appellation at the edge of the Mediterranean. The rest of the afternoon will be free to spend at your own leisure before starting the informal evening cooking class and dinner in the evening. We’ll stroll through magnificent town of Pézenas and its many artisanal shops. We’ll lunch at one of the town’s leading regional restaurant. After some time to relax, we’ll conclude with the evening cooking class and festive dinner.